When it comes to buying cloth diapers, I love to experiment. I love to try different brands and different styles. When it comes to where I buy cloth diapers, I don’t do much experimenting. I have a few trusted stores that I shop with and very rarely shop anywhere else. Lagoon Baby is making it onto that “trusted store” list. There are a few reasons that I love Lagoon Baby and encourage others to shop there. I like to keep my Canadian dollars in Canada as much as possible. Buying from a Canadian business that stocks a lot of Canadian brands is just awesome. What better way to improve the national economy than to stick to Canadian stuff as much as possible? (Plus, I know that stuff that’s made in Canada is made in humane conditions due to the labor laws that this country has, and I know that workers are generally paid a liveable wage because of those same laws.) Since Lagoon Baby is located in Maple Ridge, BC, I know that I’m doing just that. Plus, shipping is pretty quick for me since I’m still in British Columbia. I’ve done my time as a work at home mom. I love being able to support other moms who work from home and stay with their babies. More to the point, I love being able to support work at home mom businesses that are truly ethical businesses instead of a rebranding business. Natalie is pretty friendly to interact with over Facebook and Twitter. She’s quick to answer and is always willing to look for answers if she doesn’t have one. Lagoon Baby’s store has some fantastic options that are not common in my city. She carries Bottombumpers, Blueberry, Peachy Green, Funky Fluff, and some other diapers that are on my wish list. Her stock is growing and changing all the time! Have you shopped at Lagoon Baby? What was your experience like? 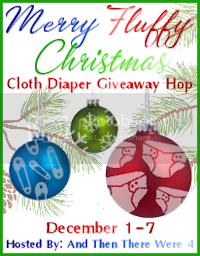 Stay tuned for the Merry Fluffy Xmas giveaway! Lagoon Baby is sponsoring a prize. Sounds like a great local store for you! I have never shopped Lagoon Baby. I do want to try a Peachy Green though! This is another one of those lovely stores I have not shopped at as yet. Love their limited stock prints – so many original options! Cloth Diaper Cover from them! I’m glad to add another Canadian Company to my list- mind I live in Ontario but oh well. I love the website and what they have for nursing moms. I love that this store stocks so much and that it stocks Canadian. I also love that I can drive there…I hate paying shipping on diapers! I’d love to get a GroVia AIO from their store! Tons of other great choices too. I would get the hemp prefolds. I think I would buy a Funky Fluff Fusion – Bamboo 3 in 1 System in Black and Pink Funk! I love the bamboo inserts; I’d love to stock up! I would love to try their Funky Fluff Fusion Bamboo! The combos are great! I’d like to get an AppleCheeks envelope cover. I might get an AMP hemp fitted diaper! I’d put the GC towards a pack of Lil Joeys. I’d buy some of their grovia discontinued prints. I love those prints! I would also like to try Peachy Green!